Update 12/24/13: Congratulations Christy! A box of Ovenly goodies is coming your way! 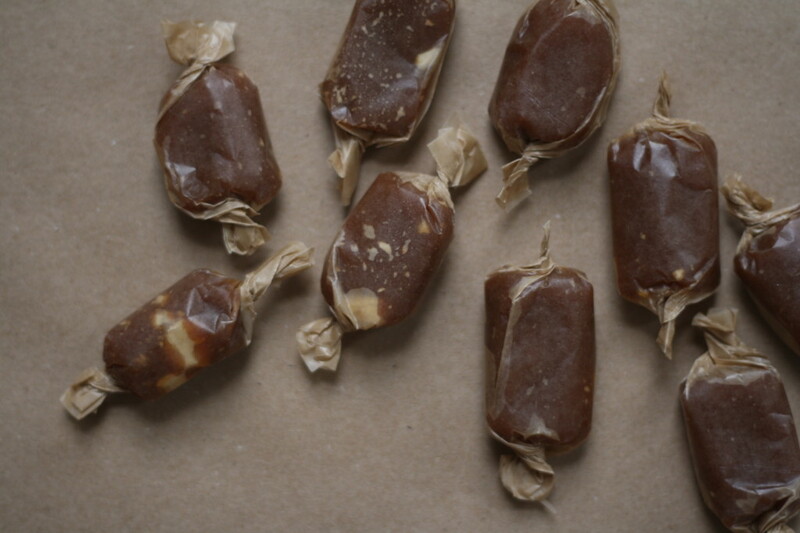 Homemade caramels have always been a sticking point (pun intended) for me. Meringue – no prob! Frosting a multi-layered cake – sure, you got it – and would you like me to bring it on the subway as well? OK, see you soon! I have quite a lot of patience when it comes to kitchen projects but there was something about caramel-making that I could never quite get to work out. My attempts always left me frustrated and disappointed, not to mention caramel-less, which may be the most depressing fact of all. That was until I had the irrational obsession with making homemade caramels for the holiday season. I told myself: they’d be perfect for any and all moments! A last-minute thank you! A office party dream! But the reality was that I was either making batch after batch of beer-infused caramel sauce or hard toffee topped with pretzels. Neither were my attempt of soft, chewy caramels. I made too many of these unsuccessful batches before I finally broke down and tried a batch with corn syrup. That was all it took for all my caramel dreams to come true. That and I invested in a candy thermometer which I will say is also a requirement. But after that, then you really just need an afternoon and a thorough moment with the directions before beginning. 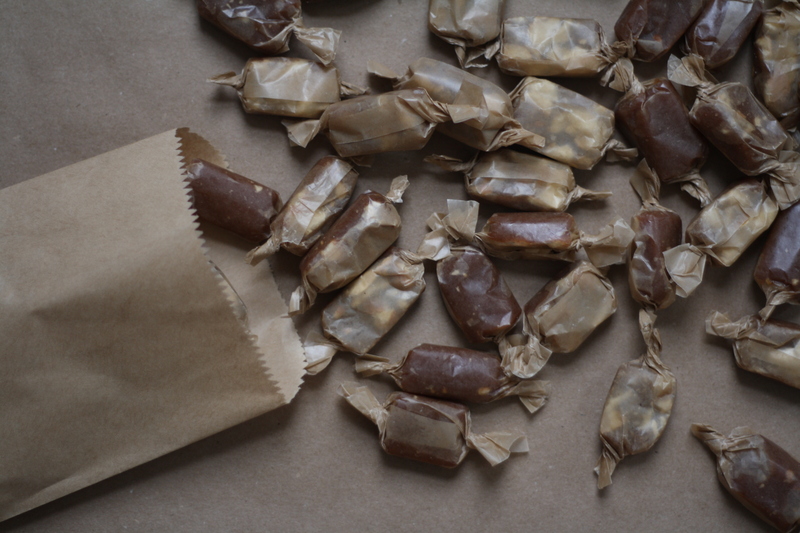 But the no-joke best thing about caramels is that one batch makes A TON (read: your food gifts are covered) AND they basically last forever (or you will eat them all first). Speaking of food gifts – have you heard of the amazing bakery Ovenly? These ladies know what is up when it comes to both food gifts and baked goods that will bring your tastebuds to the next level. What now seems like many moons ago, I had the great pleasure of spending a season in the Ovenly kitchen, whipping up pomegranate buttercream and mustard spice cookies. They have since moved into an adorable space in Greenpoint, Brooklyn which if you live in the nabe then you probably already know about the awesome but if you happen to be visiting NYC then it is well worth the trip. But you don’t have to live in New York to get a gift boxful of food treats. Guess what? 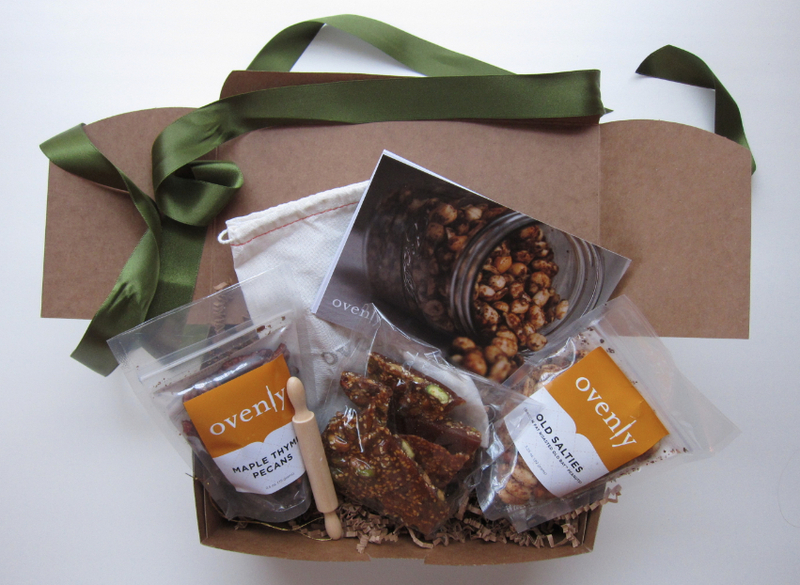 I am giving away a Holiday Snack Box of Ovenly goodies! Let me know your favorite food gift! Or you can also follow me on Twitter or Facebook and then say hi in the comments to enter the giveaway! The comments will close on Monday, December 23nd at 11:59 p.m. (EST). Good luck! P.S. This week has been bonkers exciting because on Wednesday I got to share a cookie recipe on The TODAY Show! Like THE TODAY Show. Click to watch the video and get the recipe for expresso-kissed almond chocolate chunk snowballs. Happy Holiday baking! xo! Make the beer syrup and prepare for caramel-ing: In a medium saucepan set over medium-low heat, simmer the beer for 30 minutes or so, or until it has reduced to 1 tablespoon. Give the pan a swirl every so now and again and keep a close eye on it as it begins to really reduce in volume. Turn off the heat and measure out a tablespoon of the beer syrup into a small bowl. Add the vanilla and set aside. Meanwhile, prepare all your tools since once you get going you will need to work fast. Butter and line an 8×8 pan with two overlapping sheets of parchment and butter the parchment. Dig out your candy thermometer and pastry brush. Find a whisk and heat-proof spatula. Get your biggest pot down from the cabinet. Heat the cream: In a small saucepan (or wash and dry the same one you used to make the beer syrup) combine the cream, butter and salt. Heat the mixture over medium-low heat until the butter melts, then remove from the heat, cover, and set aside. Make the sugar syrup base: In your largest pot, stir together the sugar, corn syrup and water. Use a damp pastry brush to wipe down the sides of the pan so there are no sugar crystals above the surface of the sugar mixture. Clip on your candy thermometer and make sure it is fully submerged in the sugar. From this point on, do not stir the sugar!! Set the pan over medium-high heat and let the syrup come to a boil without stirring. From now on you should not leave the pot’s side and you must devote the next 15 minutes to watching this sugar syrup come to a boil. Yes it is boring but yes it will make you delicious carm-ales. Watch your thermometer – at around 250°F it will begin to boil rapidly. At 320°F it will begin to darken. You can turn off the heat anytime after the mixture reaches 250°F and before it reaches 325°F. I turned off the heat at 320°F. Add the cream: Okay, get your whisk ready and take a breath (and/or finish the remaining 2 ounces of beer). The cream will cause the hot syrup to bubble up and triple in size so be careful. While whisking the syrup gently, slowly pour in the warm cream/butter mixture. Stop whisking when all the cream has been added. Cook the caramel and finish: Return the pan to medium-high heat and let the caramel come to a boil without stirring. Watch the thermometer closely and when the caramel reaches 248°F remove from the heat and quickly whisk in the beer syrup and vanilla until just combined. Immediately pour the caramel into the prepared pan. Tap the pan against the counter to remove any air bubbles. Sprinkle with crushed pretzels and flaky salt, if using. 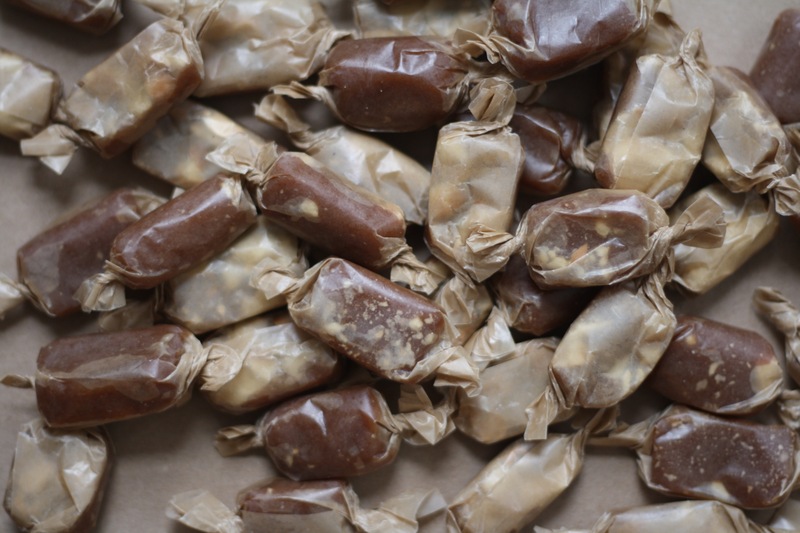 Let the caramels sit at room temperature for several hours until fully set. 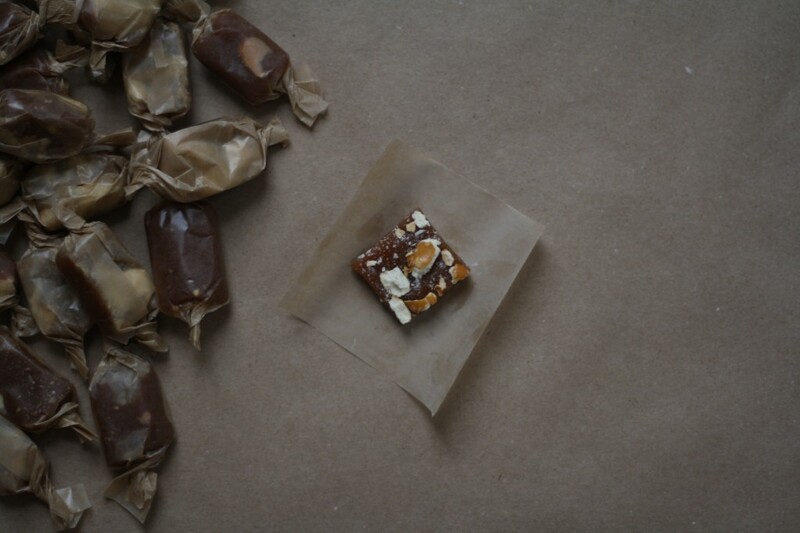 Then remove from the pan, slice into tiny squares, and wrap each candy in wax paper. Store at room temperature. Nitty gritty. One winner will be selected. The giveaway is open to U.S. and International readers. Please leave a valid email address and I will contact the winner to coordinate shipping details. This giveaway is sponsored by Ovenly. One entry (comment) per person please. The comments will close on Monday, December 23rd at 11:59 p.m. (EST). The winner will be contacted and announced on Tuesday, December 24th by 11:59 p.m. (EST). The winner will be randomly selected via blog magic. I love giving mini pound cakes. My favorite food gift – anything sweet – fudge or cookies. My favorite food gift are chocolate chip cookies! 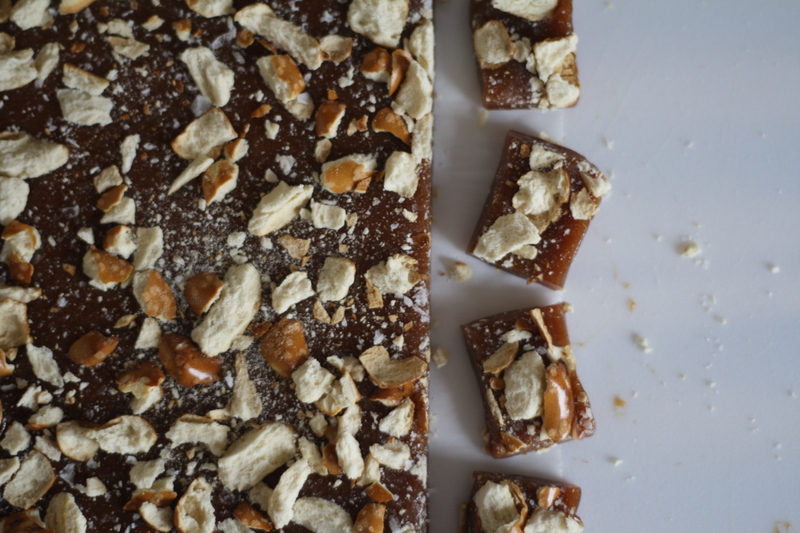 I’m going to be giving some of my friends homemade fudge this year… I love fudge! I’ve never really enjoyed candy making, but this recipe looks so good I think I’ll give it a try during my time off over the holiday. I just made caramels to give as gifts! They’re my favorite candy to give. And I learned that you can easily and effectively turn overcooked, brittle, or too chewy, caramels back into soft wonderful ones! Chop them up, put them in a pot, melt them down, add a splash of cream and cook until they reach 240-260 degrees, depending on how soft you’d like. It totally, totally worked! Happy baking! Fancy POPCORN has been a fun gifting item this year! These look beyond delicious. 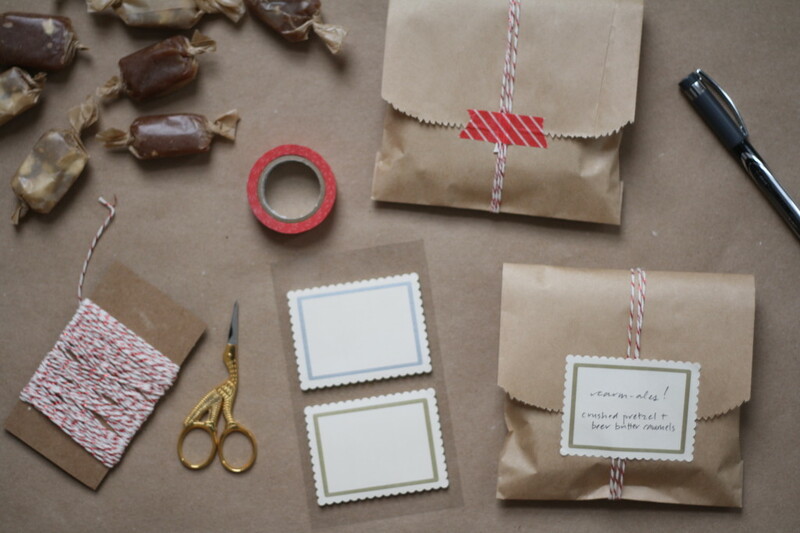 I love how you’ve packaged them too – adorable little parcels. I love giving/getting speciality cook books or a basket kits of seasonal things like hot chocolate kits for the cold weather, exotic ingredients, etc. 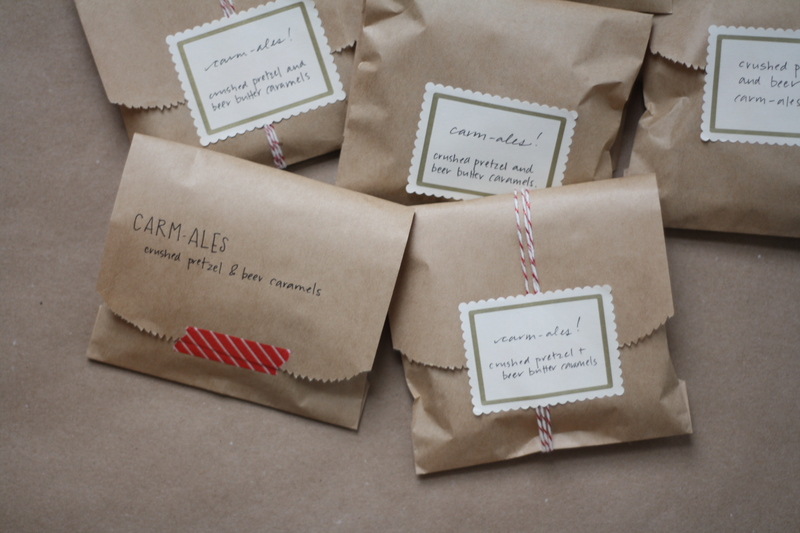 your patience sure payed off – these caramels look delicious!! we always gift cookie tins with 3 or 4 different types in my family. 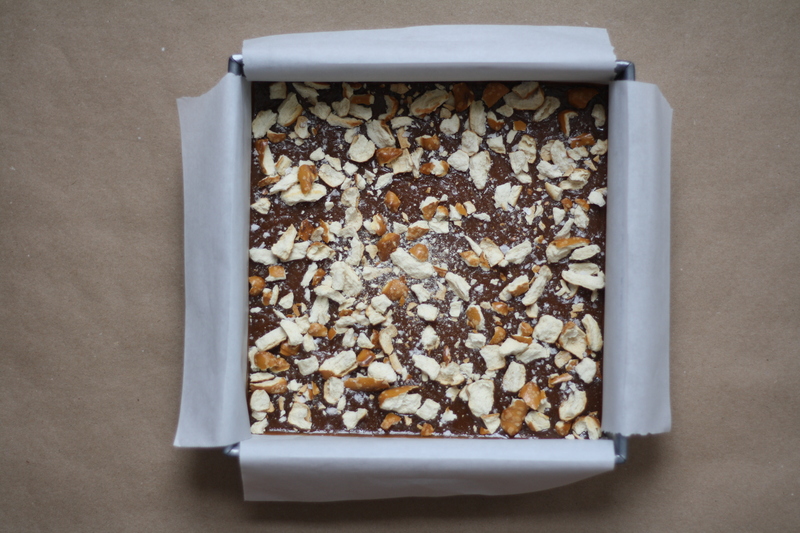 also, ovenly is a great find… thanks for sharing!! Baked goods are always such a wonderful Christmas treat to share. These would probably be good at any time of year! Nice job on The Today Show last week, Lillie! YOU ROCK in so many ways!!! My favorite food gift is probably my grandma’s famous snowball and Swedish tea rings. Cooking during the holidays is my favorite. Happy Holidays! this looks delicious! Cant wait to try! I love making and giving food particularly cupcakes. At the moment have been making a little gingerbread house as a gift for my family. It’s harder than the recipes make it look. These look fantastic! I love giving homemade goodies as gifts. I’m making chai mix to give as gifts this year. My favorite food gift is homemade truffles! This post is fantastic! Can you sub in soy milk if you’re lactose intolerant? I live right down the street from ovenly, I live for their gluten free granola bars. My absolute favorite holiday gift is homemade ginger snap cookies with chunky bits of candied ginger. Thank you for offering this giveaway! 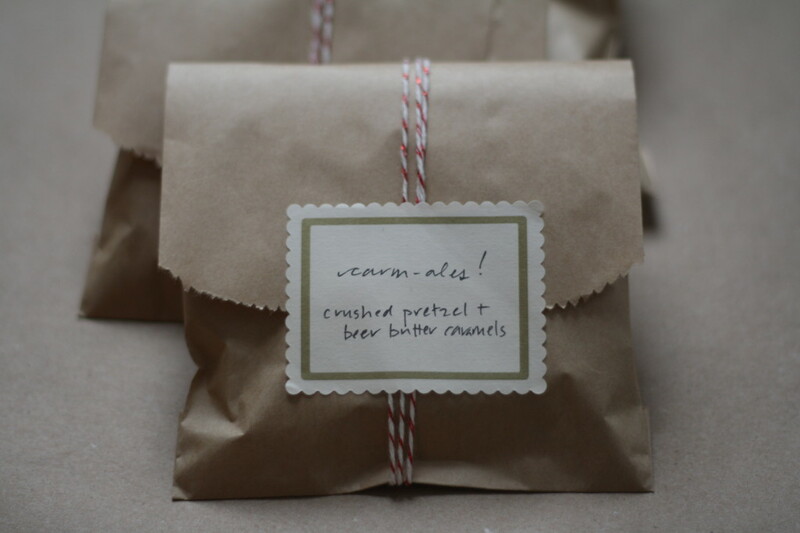 My favorite food gift is a homemade packaged mix with instructions. I don’t think there’s anything more thoughtful than that! I love making caramels and giving them as gifts too! This year I’ve made vanilla caramels with sea salt, vanilla caramels with bourbon, and “Irish Coffee” caramels. Shortbread is my other favorite thing for holiday gift giving. This looks definetly delicious! Very good idea for the Christmas season! I’m old school, making fruitcakes in June and soaking ‘em in booze until they’re ready to ship. Amazing that some of my friends still love them. But nothing tastes more like Christmas than fruitcake! I love making the ritz cracker sandwiches dipped in the white candy coating for my family and friends. It’s become a tradition in my family! Another great-looking recipe! Thanks for posting, Lillie! And great work on the Today Show! looks delicious! so fun to see you on the today show too! My favorite food gift is practically anything with chocolate — but right now I’m pretty crazy about salty/caramel-ish/chocolates. Anything from Ovenly is to die for! All of that looks sooo good!